This is a simple to follow step-by-step Recipe for preparing tasty and delicious up market restaurant style Spicy Vegetable Biryani. 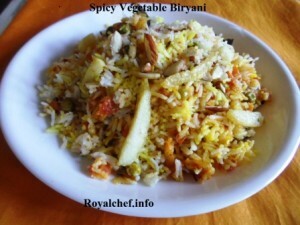 This Vegetable Biryani is a most suitable main course rice dish for any kind of party. Wash the Rice and keep it aside for 30 minutes. 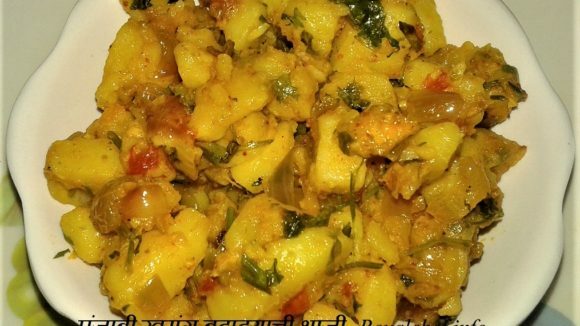 Chop the Onion, Tomato, all the Vegetables; soak the Saffron into the Milk. Heat the Oil/Ghee in a Vessel and add the Green Cardamom, Cloves, Bay Leaves, Pepper Corn, Cumin Seeds, salt and washed Rice then add hot water, mix it well and cook the rice 7-8 minutes on a slow flame. Then add Saffron Milk, mix it well and cover the Vessel for 5 minutes. Heat the Oil/Ghee in a Kadai and add the Onion, Garlic and sauté for 2 minutes. Add the Green Chilies, Red Chili Powder, Black Pepper Powder, Turmeric Powder, and Garam Masala, chopped Vegetables, ½-Cup water and then cook for 5 minutes on a slow flame. While giving layers divide the Rice into 3 portions and divide the cooked Vegetables into 2 portions. In a Vessel arrange one layer each of Rice and Vegetables one by one and then cover the Vessel with a plate and keep it on a slow flame for 5 minutes. Serve the Vegetable Biryani with Raita.